The FFQ18Q2VJU is an indoor unit only. It can be used as part of the DAIKIN-1514718 single zone system (Indoor and outdoor units included. It can also be used with Daikin Multi Zone Systems. The Vista Ceiling Cassette is concealed by a 2 x 2 foot decorative cover (BYFQ60C2W1W included) that blends well with any decor. In a drop ceiling, it occupies a single ceiling tile with no overlap. The decorative panel is a required option as the controls for your system are built into the cover. The FFQ18Q2VJU is an 18000 BTU unit and will cool a room that is about 600 sq. ft. It is just one of three sizes of ceiling cassette units available for use with specific Daikin single and multi zone systems. 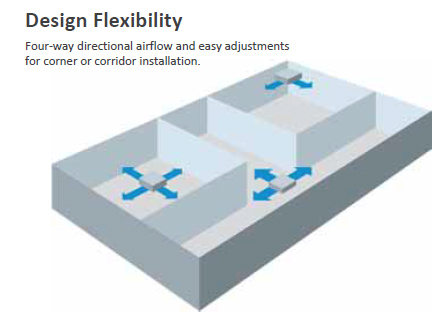 The Ceiling Cassette is offered in 4 sizes to easily accommodate each rooms unique heating and cooling size requirement: FFQ09Q2VJU (9,000 BTUs), FFQ12Q2VJU (12,000 BTUs), FFQ15Q2VJU (15,000 BTUs) and FFQ18Q2VJU (18,000 BTUs). Hot Start: When the heating operation starts or when the unit changes from cooling to heating, there is no cold draft released into the room. Mold Proof Air Filter: The pre-filter net is impregnated with a safe, colorless and odorless mold preventative. This renders the filter virtually immune to mold. 24 Hour On/Off Timer: The timer can be pre-set to start and stop the unit any time within a 24-hour period. Once the times are set, the unit can be operated for a period by simply pressing the ON or OFF timer buttons. The ceiling cassette does not include a remote but offers two possibilities (sold separately). The BRC1E73 - a wall mounted, wired navigation controller - ideal for hotel as well as residential applications (Optional BRYQ60A2W matching Presence and Floor Sensor Kit) and the BRC082A42W - an infrared remote controller with white matching sensor for decor panel. Because of the complexity of the components required for the Daikin RMXS48LVJU Multi-Zone System (up to 8 units allowable), please feel free to contact our Customer Service Department. They will make certain you have everything you need for installation of your system. For purchase and help in configuring your custom system, please contact Customer Service at 1-877-847-0050. The Daikin Multi-Zone System must be installed by a qualified, licensed HVAC technician. Manufacturer covers parts only under warranty. Installer is responsible for labor warranty.